Demand for kidney transplants is increasing. In the western world, high blood pressure and type II diabetes are on the rise and are contributing to higher rates of kidney disease. But there are not enough donor organs to meet this growing need. Stem cell based therapies may offer an alternative solution. Our kidneys help establish the correct balance of salts and minerals in our blood. They also filter out toxins and generate several important hormones. Nephrons are the key working components of the kidney. Kidney diseases are caused by damage to nephrons, which can be sudden and short lived (acute kidney disease) or slow and progressive (chronic kidney disease). Chronic kidney disease can lead to kidney failure, which is fatal unless treated by blood dialysis or a kidney transplant. Researchers are studying how stem cells might help kidneys to repair damaged nephrons and restore kidney function. Scientists are studying how the kidney can regenerate itself and what types of kidney cells are involved in this process. It is still not clear which type of cells are involved in kidney regeneration. There are several groups of cells around nephrons that have ‘stem cell like’ characteristics. One type is called Renal Progenitor Cells (RPC), Another group has features similar to mesenchymal stem cells (MSCs), cells typically found in bone marrow. Scientists are also using induced pluripotent stem cells (iPSCs) to produce 3D nephron-like structures that are being used to study how kidneys form in embryos as well as develop and test new drugs and therapies. Eventually it may be possible to use these cells to create new nephrons in damaged kidneys. Studying kidney development, kidney disease and the natural repair process is very difficult because of the complex structures and large diversity of cells in a kidney. Kidney diseases can be caused by damage to different types of cells in the kidney. Stem cell treatments will only be effective if they consider which cells are damaged and must be replaced. Cell treatments that promote natural repair pathways could happen sooner than cell replacement therapies, but researchers still need a better understanding of how the natural repair processes works before treatments can be developed. How else could stem cells help? Can stem cells be used to treat kidney disease today? The kidneys are towards the back of the body, roughly 10 cm above the hipbones and just below the ribcage. They are the body’s filtering units, maintaining a safe balance of fluid, minerals, salts and other substances in the blood. They produce urine to remove waste and harmful substances from the body. They also produce several hormones: erythropoietin (EPO), which acts on the bone marrow to increase the production of red blood cells; calcitriol (active Vitamin D3), which promotes absorption and use of calcium and phosphate for healthy bones and teeth; and the enzyme renin, which is involved in monitoring and controlling blood pressure. The key working component of the kidney is the nephron. The nephron - the functional unit of the kidney: The best evidence so far for stem cells in the adult kidney suggests they might be found in the blue area, called the urinary pole. The tubules – tiny tubes lined with a single layer of specialised cells whose job is mainly to reabsorb water and electrolytes (e.g. sodium, potassium, chloride, and bicarbonate) into the blood before the remaining waste fluid leaves the body as urine. Microscope image of kidney tissue showing tubules. One tubule is highlighted to show epithelial cells (blue), cell nuclei (green) and the tubule lumen (dark center). Kidney diseases usually involve damage to the nephrons and can be acute or chronic. In acute kidney disease there is a sudden drop in kidney function. It is usually caused by loss of large amounts of blood or an accident and is often short lived, though it can occasionally lead to lasting kidney damage. Chronic kidney disease (CKD) is defined as loss of a third or more of kidney function for at least three months. 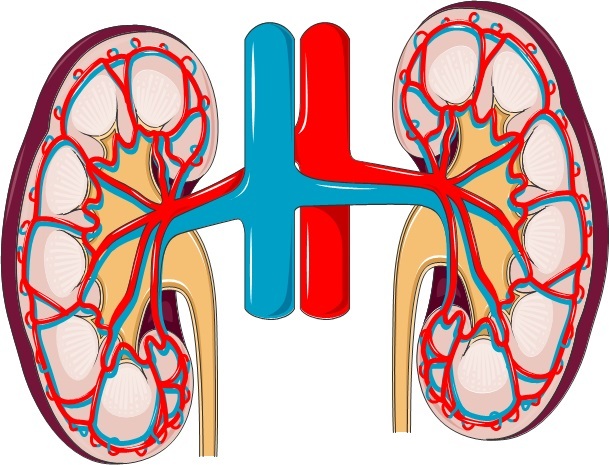 In CKD kidney function worsens over a number of years and the problem often goes undetected for many years because its effects are relatively mild. Some of the symptoms associated with CKD are: headache, fatigue, high blood pressure, itching, fluid retention, shortness of breath. However, kidney disease can lead to kidney failure (less than 10% kidney function). Once this happens, patients need dialysis or a kidney transplant to stay alive. The risk of developing CKD is increased by old age, diabetes, high blood pressure, obesity and smoking. At least 8% of the European population (40 million individuals) currently has a degree of CKD, putting them at risk of developing kidney failure. This figure is increasing every year and there are not enough organ donors to provide transplants for so many patients. This makes the development of new therapeutic options for treating CKD increasingly important. Scientists are still debating which kidney stem cells exist in the adult body and what role theyplay in the natural repair process of the kidney. . Cells found in a number of places within the nephrons have been proposed as candidates for kidney stem cells. 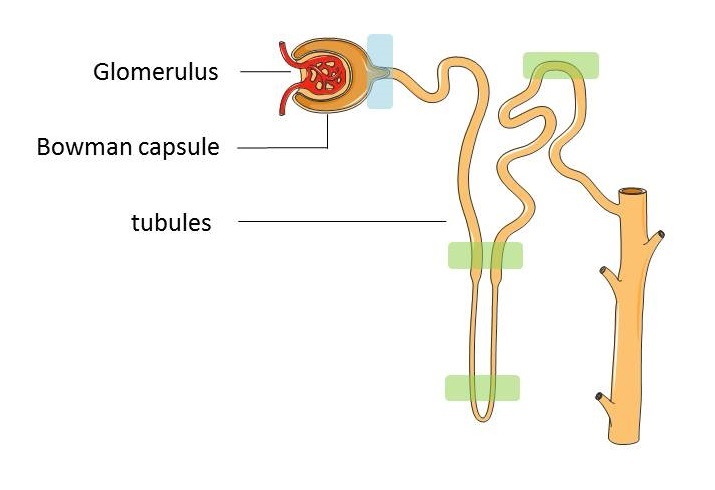 The most convincing evidence for the existence of such stem cells is the discovery of Renal Progenitor Cells (RPC) at the urinary pole of the Bowman’s capsule of the nephron (marked in blue in the diagram above). These cells have some of the key features of stem cells and researchers have shown them to be responsible for production of podocytes – specialised cells involved in the filtration work of the nephron and that need to be replaced continuously throughout our lifetime. Studies also suggest that these same RPC might be able to generate a second type of specialised cell found in the nephron lining. As well as kidney stem cells, cells with some of the characteristics of mesenchymal stem cells have been isolated from the kidney. A number of different types of cells from the bone marrow have been tested in animals and in clinical studies for potential use in kidney disease. Amongst all the cells under investigation, a type of cell commonly named mesenchymal stem cells (MSCs) have shown the most promising results to date. Studies suggest that MSCs may be able to enhance the intrinsic ability of the kidney to repair itself. Researchers investigating the therapeutic effects of these bone marrow derived MSCs (bmMSC)in the kidney disease setting have suggested these cells may release proteins that can help kidney cells to grow, inhibit cell death and could encourage the kidney’s own stem cells to repair kidney damage. Further research is needed to establish whether these ideas are correct. Clinical trials using bmMSCs are ongoing to test the effectiveness of these cellsin treating patients with kidney disease (ClinicalTrials.gov NCT02057965, NCT02387151). Cells with some of the features of MSCs appear to exist in many other organs besides the bone marrow, though there is some controversy amongst scientists about the exact nature of such cells and their roles in the body. Recently, cells with MSC-like features have been isolated from the kidney. These so-called kidney MSCs (kMSC) are distinctly different from bmMSCs. More research is needed to identify their precise role in normal kidney maintenance and to investigate their potential to enhance the kidney’s ability to regenerate or repair itself after damage. Another type of stem cell that scientists are using in kidney research is the induced pluripotent stem cell (iPSC). Induced pluripotent stem cells are made by reprogramming adult, specialised cells of the body to act like embryonic stem cells. They have the ability to develop into any cell or tissue in the body. Recently researchers have been able to use iPSCs to produce kidney cells in a very early stage of development. These very early kidney cells resemble cells found in the embryo that will turn into the cells that eventually make up the kidney in foetal development. These cells could have the potential to make the glomerulus and tubules, the building blocks of the nephron. However, a lot of research needs to be done before such cells can be used in patients to treat CKD. An alternative approach to organ replacement is also under investigation and may help kidney disease patients in the future: The use of organ scaffolds to produce whole, transplantable organs. Organ scaffolds are organs from which all the cells have been removed. What remains is the extracellular matrix – the part of the organ that supports its shape. This matrix can be seeded with a patient’s own cells, which can be carefully nurtured to grow and multiply to re-cover the scaffold. By using the patient’s own cells, the complications of immune rejection that can occur with organ transplantations are drastically reduced. The challenge with this approach is identifying and obtaining the right types of cells to seed the scaffold, especially in organs with complex structures made up of many different cells. IPSCs will be useful candidate cells for seeding kidney organ scaffolds. Experiments in rats have shown the feasibility of this approach. Apart from the use of bmMSCs in clinical trials to treat patients with kidney disease (ClinicalTrials.gov NCT02057965, NCT02387151) , stem cell treatments for kidney disease have not yet been developed. The kidney is a very complex organ consisting of a large number of different types of cells. To make a new kidney in the lab, all these different cells would need to be produced in a different way and mixed together in the hope that they would eventually recreate a functional kidney. What's more, kidney disease comes in many flavours with different cells affected and so treatments aiming to replace damaged cells within a patient's kidney would need to supply different types of cells for different patients. Research on organ or cell replacement therapies is ongoing, but this is likely to be a long-term goal. In the meantime, stem cells may benefit patients in other ways. For example, stem cells can be used to help progress our understanding of the disease through studies on the development and behaviour of kidney cells grown in large numbers in the laboratory. Stem cell research may also enable us to utilise the body's own repair mechanisms to find treatments for kidney disease. In acute kidney disease, the body can often repair kidney damage itself, but it is unable to do this well enough to tackle the progressive damage that occurs in chronic kidney disease. The recent identification of mesenchymal-stem-cell-like cells in the kidney may open up new possibilities for enhancing the body's own capacity for regeneration and repair of damaged kidneys. Investigating these possibilities by studying how these newly discovered cells work is currently an important area of research. 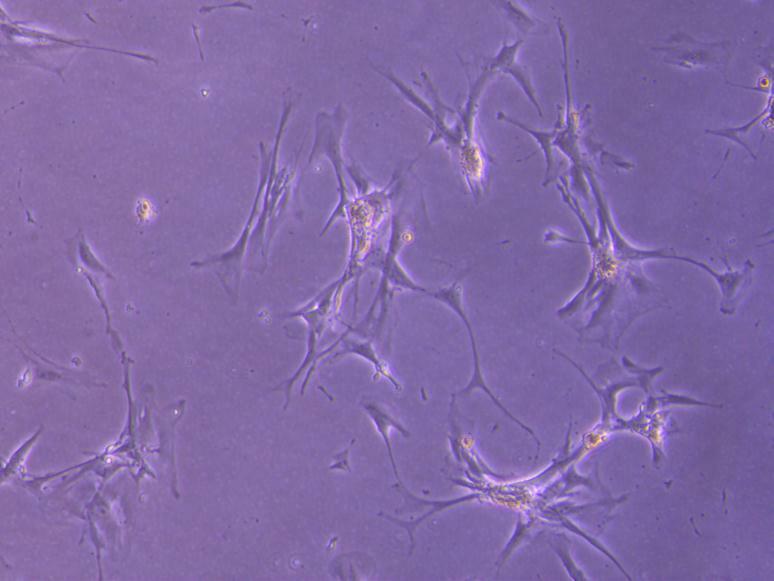 Researchers also continue to explore new ideas using emerging technologies in stem cell research, such as reprogramming cells to change their behaviour. This factsheet was created by Brigitte Wieles and reviewed by Ton Rabelink, coordinator of the EU project STELLAR. Lead image and diagram of the nephron created by EuroStemCell using Servier Medical Art. 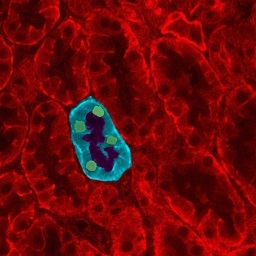 Kidney stem cell image by Brigitte Wieles. Microscope image of kidney tubules by JWSchmidt. Grandmother and grandchild © iStock/grandriver. Each day your kidneys process around 200 litres of blood, with around 1 to 2 litres of waste leaving the body as urine. We have on average 1 million nephrons and they're fully formed before we're born. Premature birth and low birth weight coincides with fewer nephrons. No new nephrons are formed after birth and we lose up to 6000 of them each year, making old age and low birth weight a risk factor for kidney disease.